Ten years ago, a group of parents in Silicon Valley came together to reimagine the public middle and high school experience. Summit Public Schools’ founding parents imagined a school that could prepare every student for college and career success. Today, Summit Public Schools (Summit) is a leading charter management organization serving the San Francisco Bay Area’s diverse communities. It operates six middle and high schools and enrolls 1,600 students. Its mission is to prepare a diverse student body for success in college and to be thoughtful, contributing members of society. Summit opened its flagship charter school, Summit Prep, in 2003 in Redwood City, Calif., but it wasn’t until nearly a decade later—three years after the school’s first cohort had graduated from high school—that school leaders decided to implement a blended-learning model. Students progress through individualized playlists of online content at their own pace, and teachers provide face-to-face support on a flexible and adaptive as-needed basis. School leaders looked at the data from that first cohort of students and discovered that only 55 percent of them were on track to graduate from college in six years. Although that number was twice the national average, the organization considered graduation from college as its primary success metric—and so 55 percent wasn’t good enough. The data showed that despite a rigorous curriculum that prepared students for college, students still had basic gaps in their learning that dated back to primary school. It also showed that the school’s teacher-led, high-support model left many students without the structure and behaviors to self-motivate. In order to overcome those issues, school leaders asked themselves, “how does a high-support model help students through a rigorous curriculum that will prepare them for college while also giving them the skills necessary to be independently successful once they reach college?” Initially, the organization tried to answer that question by piloting a Station Rotation model of blended learning for math using Khan Academy. After a year of using that model, school leaders evaluated the data and realized they needed not only to blend face-to-face and online instruction, but to rethink the entire school experience. 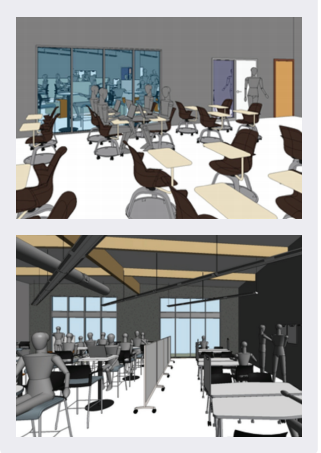 As a result, they pioneered a self-paced and self-directed learning environment in which they reimagined the roles of the students and the teachers, rethought and redesigned the learning spaces, and removed time-based practices that hindered personalized learning. Summit believes that students’ deeper-thinking and cognitive skills are crucial to collegiate and real-world success and that the best way for students to develop those skills is through project-based learning. Students spend 100 hours per subject each school year engaged in projects that range from science experiments to history presentations to interdisciplinary projects that cover concepts in multiple subjects. Teachers divide students heterogeneously into small groups, which spend the majority of most school days working together on projects. Although students have some autonomy over what resources and tactics they use to complete their projects, they must adhere to minimum pacing guidelines as set by teaching staff. Summit believes that developing a basic understanding of concepts is the essential first step toward students developing deeper cognitive skills. 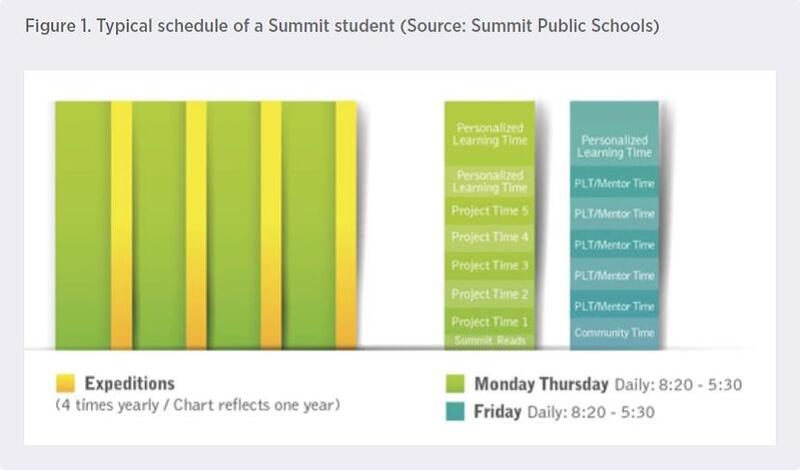 In order to give students opportunities to learn basic concepts, Summit has baked eight hours per week of online personalized-learning time into the students’ weekly schedules. It also expects students to spend at least eight hours per week outside of class progressing through personalized online content. 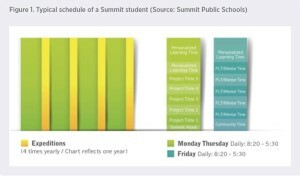 The key tool facilitating each student’s online personalized-learning time is the Summit-developed Personalized Learning Plan (PLP), an online tool that allows students to set learning and personal growth goals, track progress through online content playlists, receive immediate feedback on their work, and access learning resources at any time. Summit designed the PLP to be a dynamic tool in which students, families, and teachers alike could offer support and coaching. Although Summit allows students to control the pacing of their learning, it has also built some structure into the students’ school weeks to ensure that they have access to help and support if they need it. One way Summit accomplishes this is by having teachers serve as student mentors. Teachers typically mentor 10–15 students each school year. Every Friday students lead 10-minute one-on-one meetings with their mentors to review their PLPs, track their academic progress, and receive coaching on their self-directed learning skills. Mentors don’t just support students in their curriculum, they also serve as college counselors, coaches, family liaisons, and advocates to ensure students are excelling inside and outside of the classroom. Reading and reading comprehension are important parts of Summit’s goal to prepare students for success in college and career. During Summit Reads, students spend two hours per week developing their reading and reading comprehension skills using an e-reader called Gobstopper. Gobstopper’s functionality allows teachers to embed quizzes, worksheets, comments, and videos within the online text. Gobstopper’s analytics platform enables teachers to determine how long students have spent reading the text. Teachers use this data to assess students’ reading comprehension and shape their reading discussions with students. Students meet together each week in small, collaborative groups to spend 45 minutes engaging in discussions about issues important to them. These Socratic dialogues reinforce the Summit community’s values of respect, responsibility, courage, compassion, and integrity through the exploration of topics such as vulnerability, motivation, and self-advocacy. Summit’s model gives students plenty of opportunities to engage in real-world experiences and passion projects. For eight weeks of the school year, students engage in Expeditions, which can range from internships at nearby companies to intensive photography courses that allow students to pursue elective interests. These Expeditions allow students to do deep dives into careers and passions and to practice their skills in real-world settings. Students’ daily schedules are not all alike, but students typically begin each day with Summit Reads and then spend the rest of their day in project time. Fridays are different because students devote the majority of their time to personalized learning. Fridays begin with community time and then individual mentor meetings. Students spend the rest of their day progressing through their PLPs at their own pace. During both personalized-learning time and project time, teachers walk among the students, helping them if they get stuck on a particular concept or lesson and answering any questions that arise. Teachers also use student data to offer additional individual or small-group instruction to students who are struggling with the content. Although teachers offer support, the focus at Summit is on having students self-direct their learning. To implement the new model successfully, Summit did not just need to re-envision the school experience for students, but also for teachers. In the new model, the teacher’s role shifted from delivering content to focusing on the students’ development of cognitive and non-cognitive skills. Given Summit’s focus on continued improvement and innovation, analyzing online data is an especially important part of the teachers’ roles at every school in the network. Schools collect student achievement and improvement data daily and analyze results weekly so that teachers can make critical pivots in day-to-day experiences of students to impact learning on an as-needed basis. Teachers and school leaders at each Summit school meet twice per week as a project team and once a week in their course-level and grade-level teams to review real-time data, including accountability and performance data. Summit also tracks student growth, achievement, and outcomes on an annual basis to help understand the big picture of each student’s individualized learning plan. Summit has had a unique teacher-development system in place since before it began implementing blended learning. During the eight weeks per year that students are in Expeditions, teachers participate in professional development that teachers develop and lead. Summit evaluates teachers using primarily a skills-based system that focuses on what teachers need to know and be able to do to accelerate student achievement. The system measures teachers using seven categories: assessment, content, curriculum, instruction, knowing learners and learning (special education and English language learners, for example), leadership, and mentoring. Depending on how well they can demonstrate their expertise in each of these areas, teachers are placed at one of four levels: basic, proficient, highly proficient, and expert. The onus is on the teachers to provide evidence of their performance, and a combination of principal evaluations, peer evaluations, and self-evaluations factor into advancement decisions. Since its founding, Summit has retained 85 percent of its teachers. Summit provides students with their own Chromebooks, which must remain at the school. Students use the Chromebooks to access their PLPs. The content playlists within each PLP are housed within an online content-delivery system called Activate Instruction, which the Summit team, with support from the Girard Foundation, worked with Illuminate Education to build. It delivers personalized playlists of open, proprietary, and teacher-developed online content in each subject. Activate playlists offer a diverse array of learning resources that students can work through at their own pace to learn the content. Assessments are embedded into each playlist so that students can go directly to the assessments when they feel they have mastered the content and are ready to move on to the next unit or lesson. The PLP tool provides a portal for students to understand where they are, where they need to go, and access to all the resources, including Activate, ShowEvidence, and Gobstopper. Data from Illuminate is linked directly to the dashboard so that teachers, mentors, students, and parents can see at any time where the students are in relation to their courses and larger goals. Summit takes a lean startup approach and has a deliberate and thoughtful culture of innovation. The organization uses the “Build, Measure, Learn” cycle developed by author and veteran entrepreneur Eric Ries in his book, The Lean Startup. This process is user-driven, which means that Summit’s leaders highly value student feedback. Summit holds regular focus groups, encouraging students to speak up if they feel something is or is not working. School leaders have designed Summit schools to be self-sustaining on the traditional state and federal funding allocation, with a small amount of parental fundraising once they reach full capacity. Summit provides startup funding to each new school. This funding supports the school in its first years of operation and allows the school to open with its inaugural grade-level and slowly build the school culture one grade-level at a time. Although the startup grant is unrestricted and is not tied to any specific expenses, it covers primarily the administration, facility technology, and supply costs during the school’s growth phase. California measures academic performance and school improvement using its Academic Progress Index (API). The API is a number ranging from a low of 200 to a high of 1000, which reflects a school’s performance level, based on the results of statewide assessments across multiple content areas. The state has set 800 as the API target for all schools. All four of the schools in Summit’s network scored higher than the state’s target of 800. These scores, however, are from before Summit implemented blended learning. Additionally, 100 percent of Summit graduates from the 2011–12 school year met the University of California’s “A–G” subject requirements and 96 percent of those graduates were accepted to at least one four-year college or university. Summit has not yet released data about the effect of its Flex model on student performance. Summit differs from many schools and districts in that it considers collegiate success—rather than successful standardized test scores—as the most important measurement of its students’ success and the ultimate outcome for their students. Thus, Summit tracks not just performance on standardized test scores and college matriculation rates, but also how students fare in college and college graduation rates. Summit currently operates six schools that serve approximately 1,600 students. It plans to grow its network to 14 schools and 6,000 students. The newest schools are Summit Denali and Summit Shasta, both of which opened during the 2013–14 school year. Summit Shasta began by serving only ninth graders, but will add one grade-level each year until it is a 9–12 school. Summit Denali opened with only sixth graders, but will also add one grade-level each year until it is a 6–12 school. 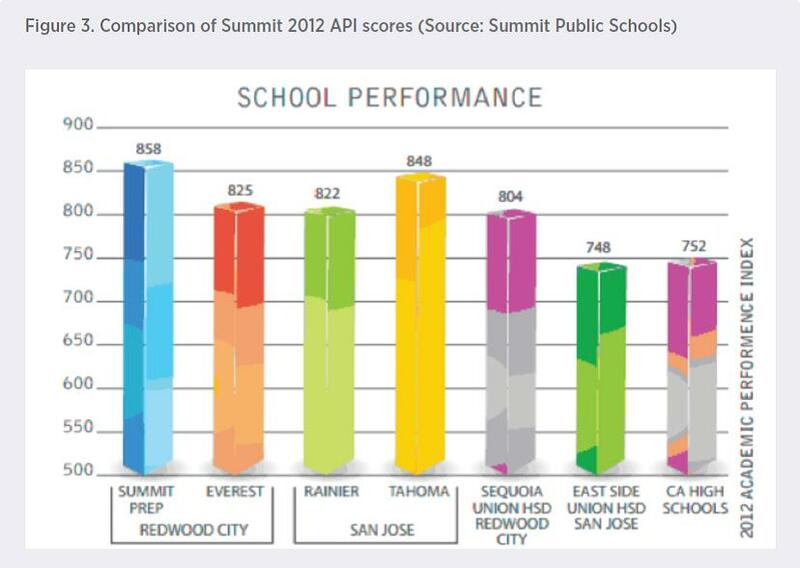 Summit plans to open another school in Richmond, Calif., in 2014.